Last year my husband helped me test a couple of copper bangles with embedded magnets, and since he's still using them, I'm testing this one myself. Magnetic therapy is a polarizing subject, with strong opinions expressed pro and against. Current science dismisses the therapeutic value of magnets as unproven and unlikely, however, there are too many success stories out there for me to believe that they are all self-suggestion and placebo effect. Anyway, once you experience chronic joint pain, you become suddenly more open-minded to remedies that don't come out of a mega pharmaceutical conglomerate's laboratory! 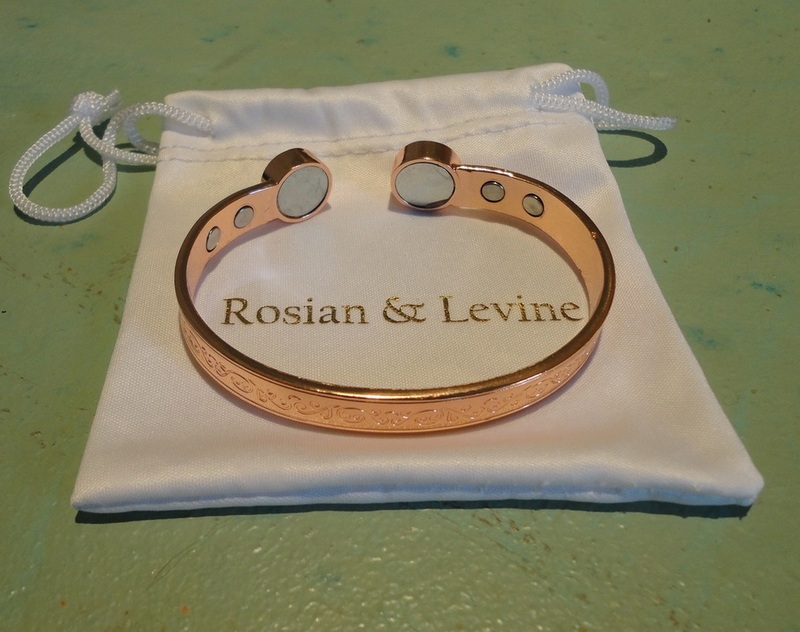 I have used magnetic pads in the past (the kind attached to elastic bandages) with satisfactory results, however, never anything as beautiful as this copper bracelet. 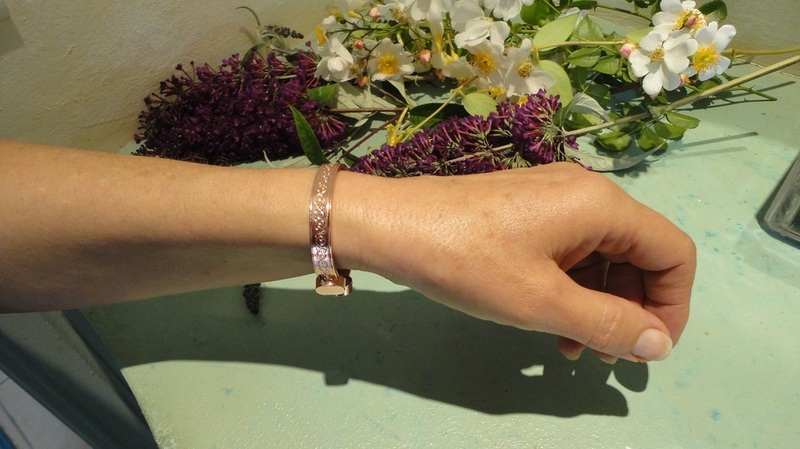 The pure copper bangle is very soft and malleable, it can easily be opened and closed by pulling on the ends and will conform to your wrist as desired. 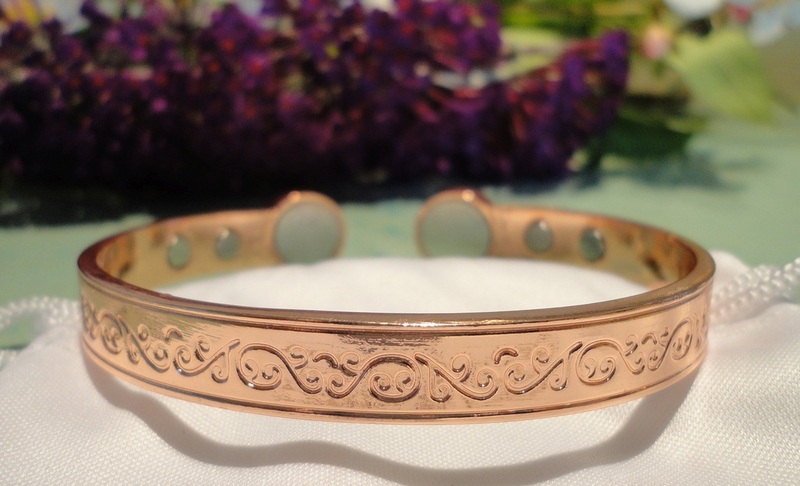 The copper is highly polished and engraved on the outside with a pretty design of flowing waves and swirls, almost Celtic and classically beautiful. On the inside of the band are six magnets (two larger than the others). My band came complete with a pretty storage bag in a cream-coloured silky fabric with a drawstring closure. 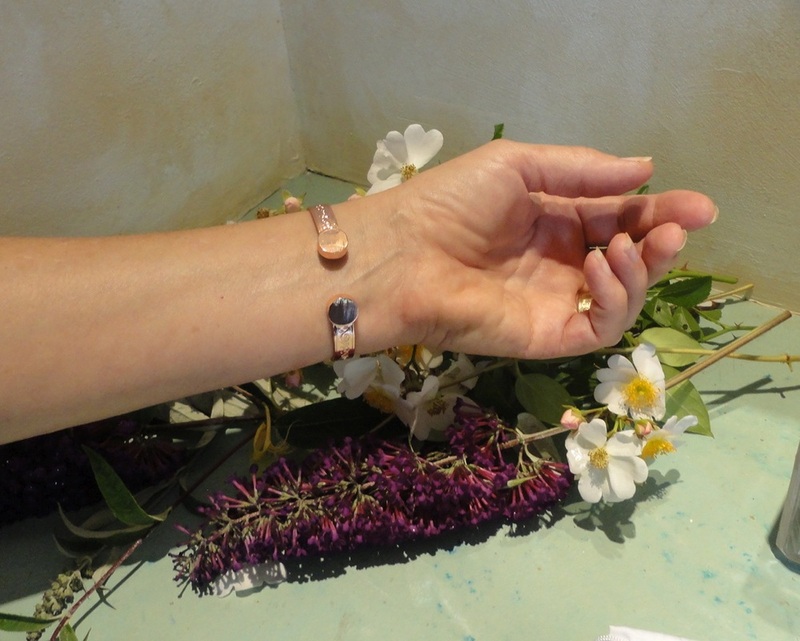 In this bangle the magnets are positioned so they can be as close to the skin of the wrist as possible but, in my test, I believe the benefits extended to the whole hand. 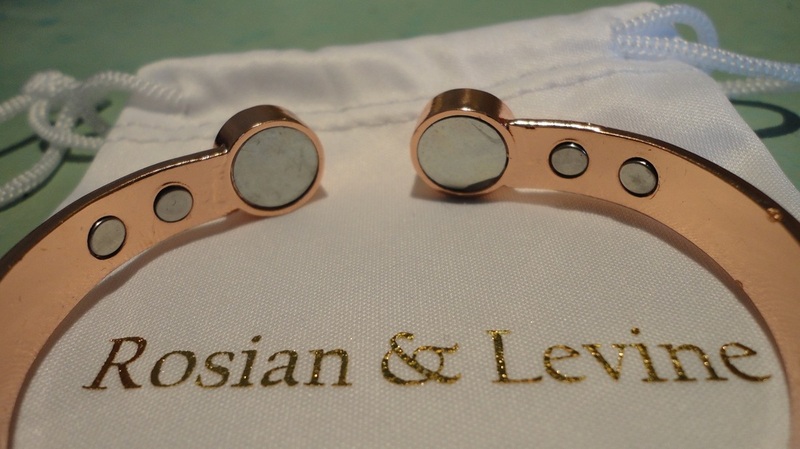 The main point of wearing a copper band is to get relief from the pain and swelling of arthritis, but other conditions also benefit from the increased blood flow in the area. I started wearing the bangle on my left but quickly switched it to my right arm, to target a very enlarged middle finger that had been a problem for over a year. After 18 days of daily wear, my finger is visibly less swollen and the pain has abated, so perhaps the bracelet has something to do with it. Whatever you think of magnetic therapy, a bangle like this is a very small purchase and, personally, I would not dismiss the chance of getting some relief. And even if were only a placebo effect, I see nothing wrong with that. We all perceive pain differently. If something like a pretty piece of jewellery can make pains and aches less noticeable, surely that is a good thing, especially if it reduces the use of medication. Sample unit provided at no cost for test and evaluation. 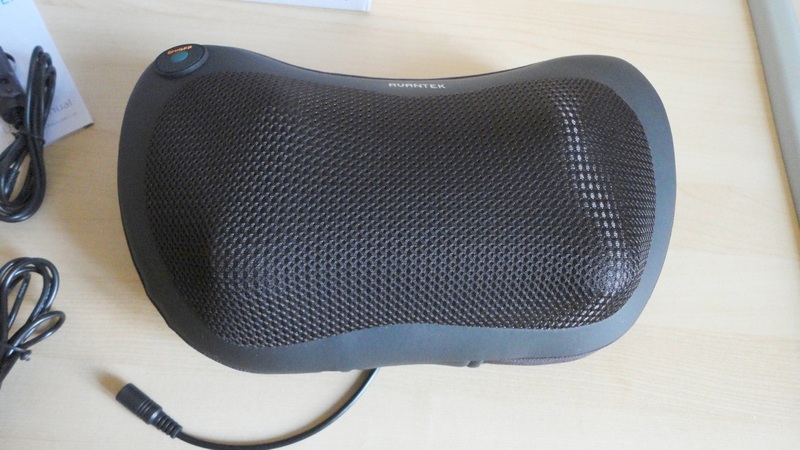 This electric massaging pillow is just heavenly! It's powered by electricity from a wall outlet but also, most thoughtfully, from a car cigarette lighter. The unit consists of four metal spherical rollers covered in a soft mesh fabric. When activated, the pillow lights up and the four rollers rotate producing a fairly strong massage action that soothes and comforts sore backs, easing fatigue and muscle knots. Every few minutes, the rollers reverse direction. 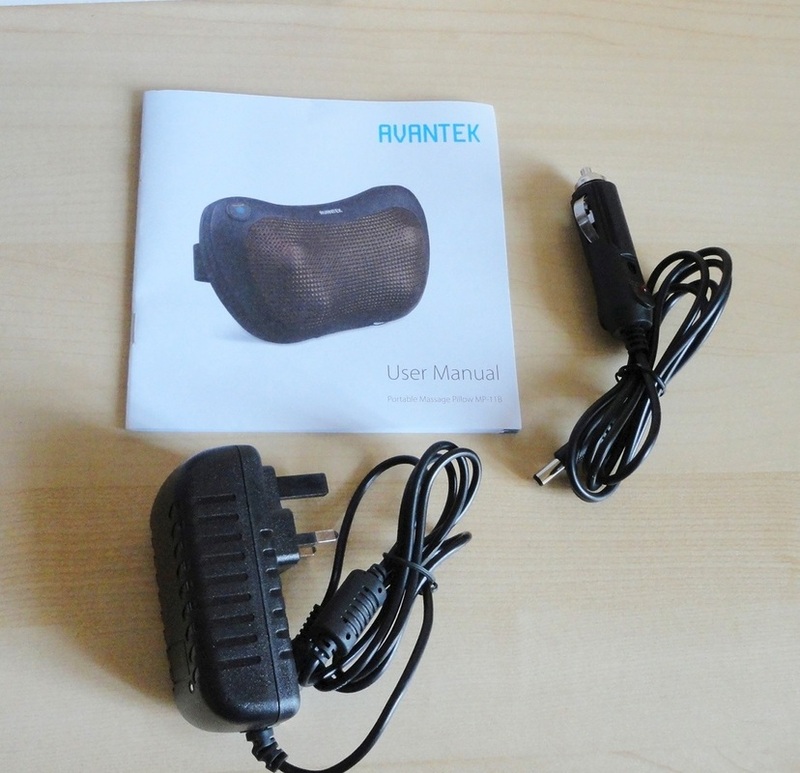 I did not expect, and was pleasantly surprised by, the robust action, it really feels like a deep massage and you can press into the pillow to intensify the experience. A cleverly-designed appliance which can be used in different ways. Apart from the fixed chair position, you can massage the back of your thighs, upper back, neck area, etc. The only drawback is the length of the lead, which means that you need to be sitting right next to a power point, or else use an extension cord. However, the car cable is fine. My husband has suffered with a shoulder strain that would not let him sleep, and this massager has been invaluable over the last ten days. Even without a particularly painful back, it's soothing for anyone who sits at a desk for hours on end (and that describes a lot of people, unfortunately). Highly recommended. 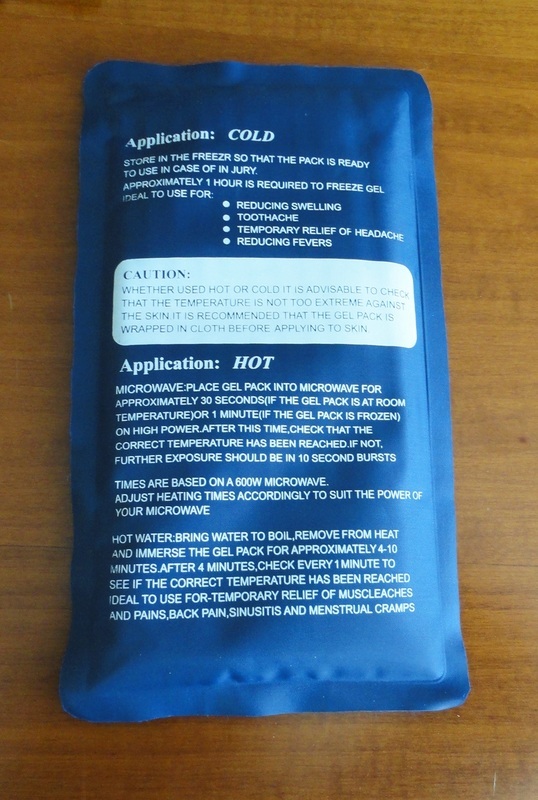 A sample of this product was provided for my evaluation and I was eager to test it because I have been using similar hot and cold gel packs for years. It's handy to keep them in the freezer for emergencies, or just for when you've overdone something and a bit of cold therapy can help the swelling go down, or some heat can soothe and calm the pain. The perennial issue is how to get the pack to stay in place if, like me, you can't always stay sitting still without moving a muscle. 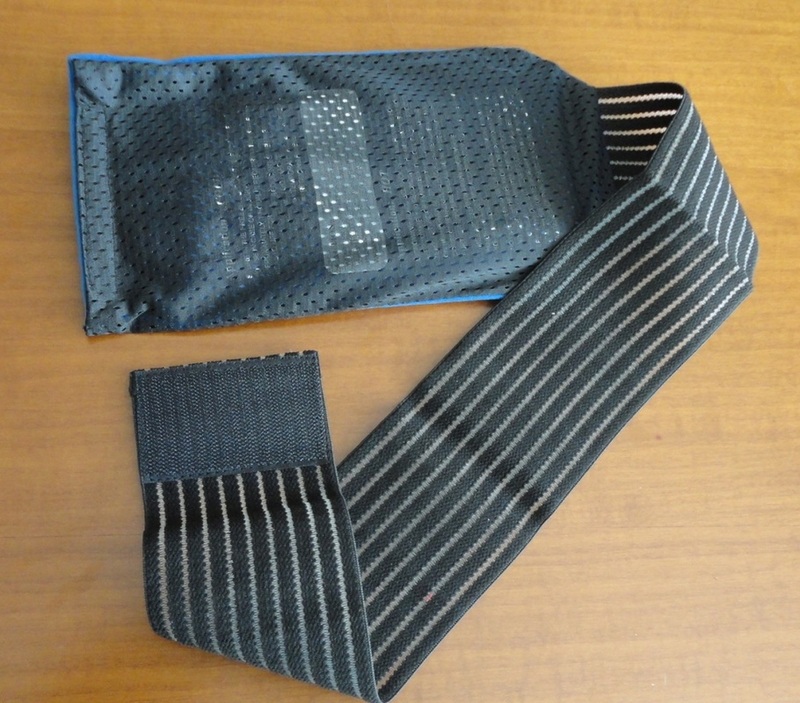 So the great advantage of this kit is the pouch built into the bandage, or sling system, which allows a certain mobility, as well as perfect positioning of the pack. 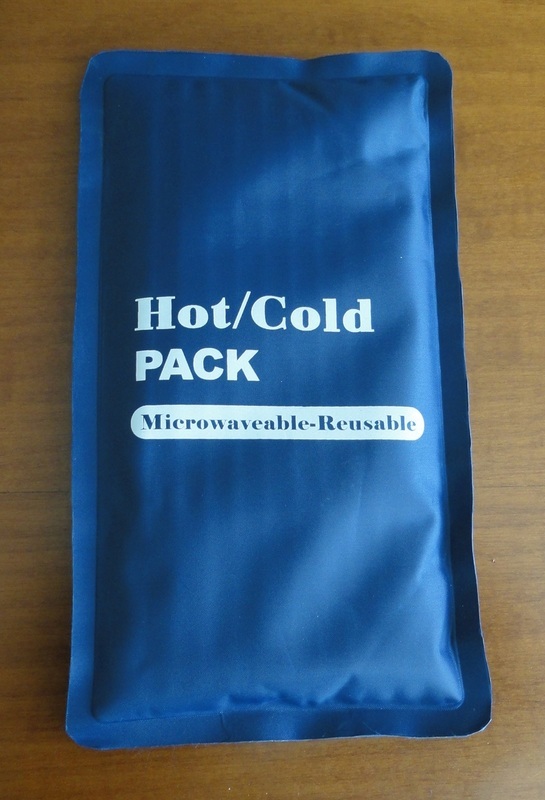 Since I don't own a microwave, to heat the pack I soak it for about 5 minutes in water that has just been boiled, but in general I tend to use these packs cold, right out of the freezer compartment, so I might add a small cloth to mitigate the effect, depending on the application. 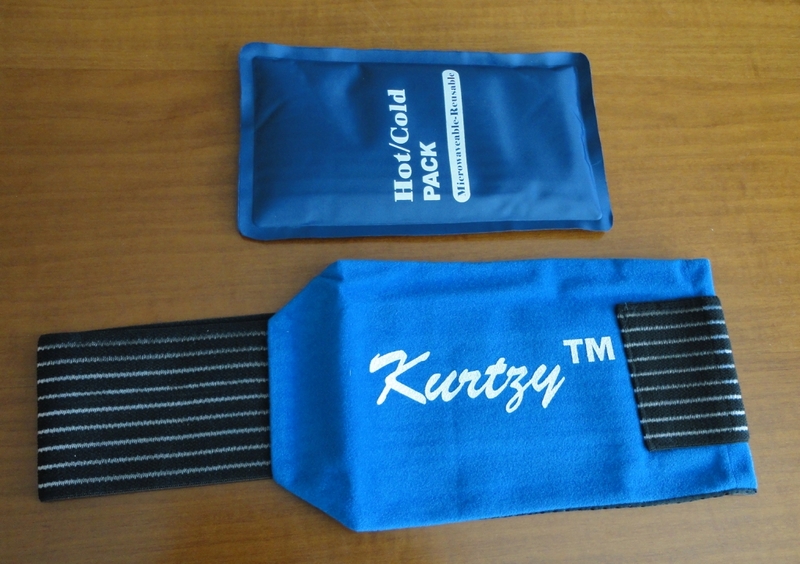 I think the integral pouch has been well designed and the generous length of the elasticated sling (85 cm or 33 inches) allows it to be secured around a leg or arm with multiple passes, or around your waist, for lower back pain relief, for example. 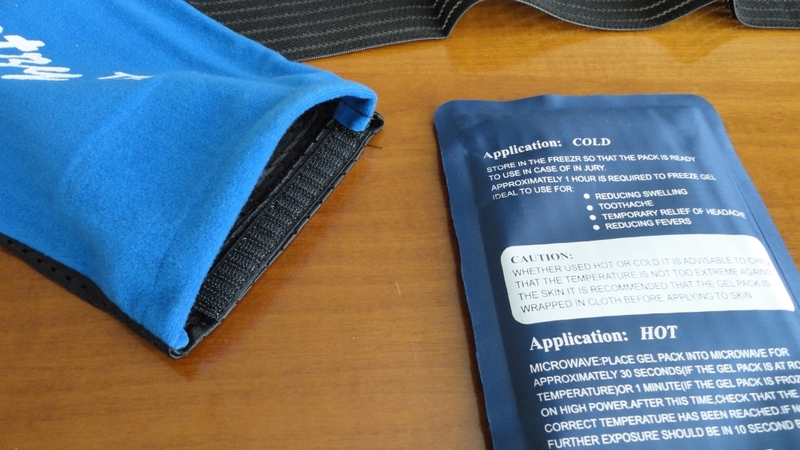 It may seem like a small detail, but if you've ever tried to attach a hot/cold pack to your body with just an elasticated strap, you will know the frustration when the weight of the pack drags it out of position. 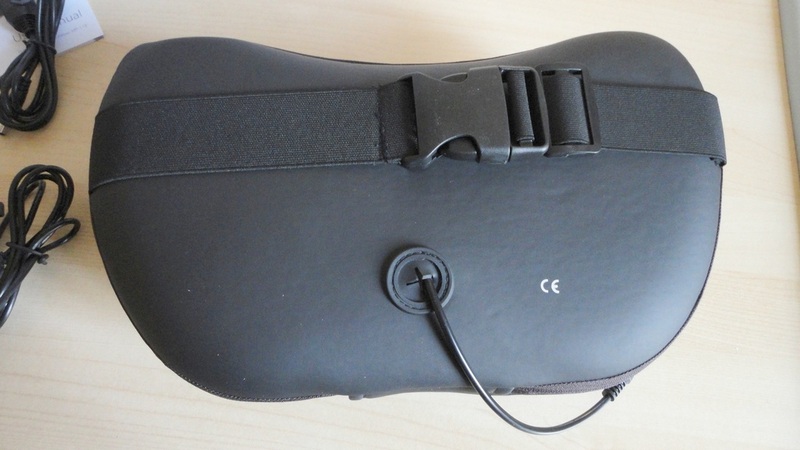 The quality of the materials appears very good and I expect to get quite a lot of use out of this kit.